37 prize - ALGARVE GREAT DERBY (semi-final) !! Our loft perform also well in the Algarve Great Derby semi-final and won 37 prize out of 1.469 birds (250km). Although we were only seconds behind the top prizes, we are very satisfied with another good performance in a World Leauge Championship race. 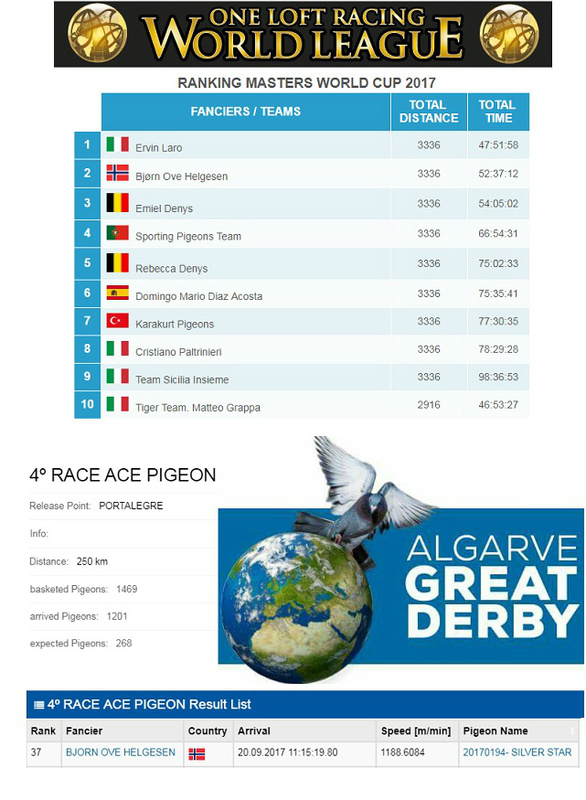 We are still 2nd ranked after 14 of 16 races and looking forward for the comming finals in Costa del Sol and Algarve Great Derby. Our 37 prize winner "SILVER STAR" is an orginal Helgesen Racing Pigeon were both father and mother are born at our loft. FATHER is a grandgrand child "HARRY" from Jan Hooymans, in addition to grandchild "TOTILA" x "HALLA" from Jens Borker.